But hey, maybe you’re convinced you’re the sole anomaly immune to such threats. Maybe you received a shiny MacBook for Christmas that you’re certain is invincible — after all, it’s brand new. Unfortunately, cyber crimes don’t discriminate based on a device’s make or age. Just recently, a Trojan Rat infested the popular software Handbrake, allowing cyber criminals to take complete control over affected devices to steal passwords, credit card information, and other important personal details. Neither Windows nor Mac users were safe from the attack, a tidbit that emphasizes the indisputable importance of taking cybersecurity seriously. 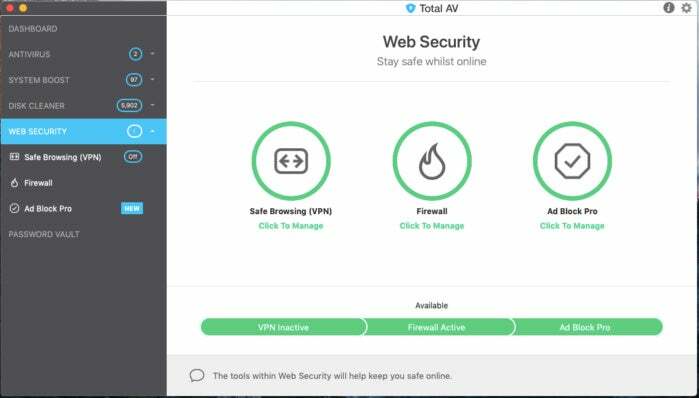 When it comes to protecting your devices, proactivity is vital, which is why it’s worth checking out TotalAV’s award-winning antivirus protection. Compatible with both Apple and PC devices, TotalAV covers all the bases when it comes to cybersecurity while improving your computer’s performance. First, it scans your device for hidden threats and viruses using a state-of-the-art algorithm, identifying potentially dangerous malware or tracking cookies and removing them swiftly. Afterwards, it’ll alert you to any security vulnerabilities it’s discovered on a simple, streamlined interface. At the same time your device is undergoing this antivirus detection, TotalAV will locate and remove any redundant files and cached memory — files that will gradually slow down your device — to keep your device’s speed and performance up to snuff, all at no extra cost to you. We’ve team up with TotalAV to offer our readers a massive 80% discount off its Mac- and PC-compatible software. After an installation process that takes mere minutes, you can be sure your devices will be protected for life. Plus, its software comes with free licenses for your other devices so you can keep your office and home computers, smartphones, and tablets running just as secure. This story, "Get TotalAV Essential AntiVirus for $19.99 (80% off)" was originally published by CIO.